I decided it was a Really Good Idea, having proposed to make infrastructure for the the Poem Windows, to try out the system to make sure it would actually work like I expected. I bought a Geeekpi 7" 1024x600 display with Acrylic Stand and assembled it. It arrived without instructions of any kind. There were 5 acrylic pieces, a PCB, an LCD, and a bunch of little nuts and screws and other things. I went to the Amazon page, where there were several pictures that were actually sufficient for most of the assembly. I discovered the hard way that you needed to get all the cables connected before trying to assemble the stand, but I had only been hooking pieces together very loosely, so it was not much work to disassemble and then reassemble the stand after everything was hooked up. The only really frustrating part was trying to attach the ribbon-cable video connector, which was not described anywhere nor clearly visible in the video. Voila! 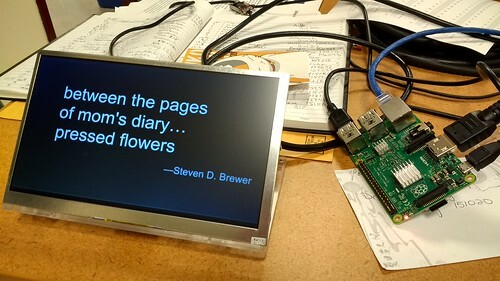 One Poem Window prototype, suitable for testing and display. 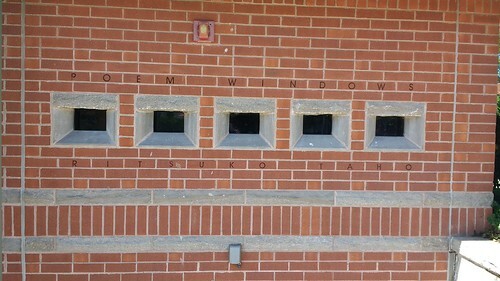 With all my "free time" this summer, I decided to write and shop around a proposal for a Makers at Amherst Media project to refresh the infrastructure of the Poem Windows in Amherst. I've been working with Rene Theberge and the the Amherst Public Art Commission to craft a plan and find the necessary funding. Created in 2002 by a Japanese artist, the project was abandoned after the original technology failed. Evidently, it never worked particularly well, especially in cold weather and, after a few years, quit altogether. But it was an idea that resonated with me. A few years later, Amherst Coming Together tried a second attempt that used iPads, but it was not a good technology decision and mostly seemed to display error messages about installing updates. I propose to replace the equipment using inexpensive Raspberry Pi computers and small displays that simply show a URL in a full-screen browser window. This is all the system actually does: When the computer starts, it consults a file on the network that determines which URL to show: the page displayed at the URL is responsible for showing the necessary content. The browser also uses a plugin that will retry periodically in case there is a transient problem with network connectivity. In addition, the system checks the operating system for integrity and pushes updates out to the computer every morning, which is important for security. This design is based on the system for providing Inexpensive Digital Signage that I developed for the College of Natural Science at UMass. We support around a dozen signs and also use a variant of the same system (combined with a script mostly developed by BMB) to monitor -80 freezers. It should work fine in this context. 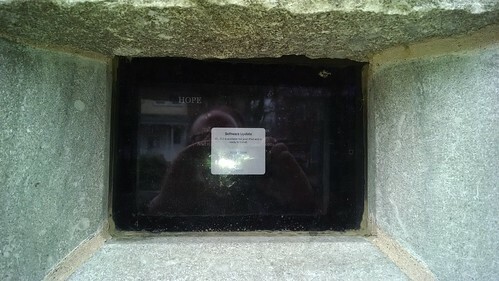 I also had an idea that might provide some level of on-going support for the poem windows installation: invite organizations, businesses, and individuals to purchase their own "poem window" the price of which could be set sufficiently high to subsidize the permanent installation. It would basically use the same components, plus a low-cost acrylic frame, to enable it to sit on a counter or table. 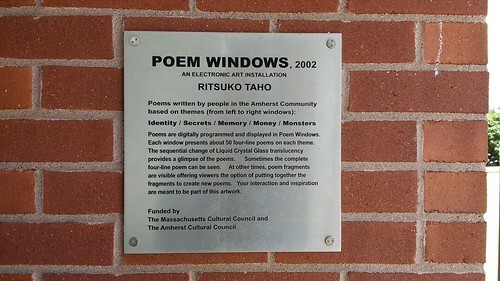 If there were more poem windows where people could see them, it could also increase the incentive for people to contribute poetry and images for the displays. It could also help keep the Makers busy, if they agreed to take up the support effort. The proposal does not address how to collect and present the content for the new displays. That will need to be a separate effort that will technically require a website with a page to accept submissions and a presentation page that, when run full-screen, will be the display that is viewed by the poetry windows. But it will also require a committee of people to establish criteria for submissions, run a campaign to solicit submissions, and a process for judging submissions and approving some for display. I hope to also have time to contribute to and help shape that effort. But one step at a time. Early in the fall, I got a call from someone in Facilities Planning to let me know that the campus was developing some kind of Makerspace project. It was kept under wraps until quite recently when a Makerspace Charette was announced. There were nearly 100 people that came: the usual suspects, but also a lot of new faces I hadn't seen before. The first hour was spent mostly with presentations from the administration, explaining the process and the context. It turns out that, with the new Design Building, there is space in the Fine Arts Center Bridge that will become available to be repurposed and renovated. And there is money already in hand to do the renovations. The administration has heard of Makerspaces and wants to see if they can build one here. And to show how serious they are, they've hired a consultant: Cambridge 7 Associates. After that there were a bunch more presentations from some of the makerspace leaders on campus: mostly engineering (M5, Innovation Shop, Queer Lights) but also from the library and the new entrepreneurship program. As the presentations wound down, there were a number of occupants of the building who had only just learned that the charette was happening. They spoke up to mention their space issues and hopes that some of this space could be available for their needs. First, the process is completely backwards. We ought to be thinking about how to use the Maker movement and principles to transform pedagogy and the student experience on campus, where appropriate. And only then to think about how the financial, physical, and human resources on campus could be best deployed to support that mission. It's perhaps understandable, given that the money and space are available and that the funds can only be used on campus that people might ask the question this way. But it seemed that everyone agreed it was the wrong way to do it. I learned that the UTAC committee is talking about coordinating with Amherstworks to develop a Makerspace. This was news to me. But, of course, everyone is trying to build a Makerspace everywhere. In fact there are already makerspaces all over campus and all of them need resources to make them work better. A big challenge is that what makes makerspaces work is people with the right skill set -- that bridges technology and pedagogy -- with enough time in their portfolio to support a makerspace. This is especially true if we want to make makerspaces more accessible (to have a hub that can tie together all the satellites). But the largest challenges are perhaps the institutional barriers that make it difficult to collaborate across University boundaries and divisions. In spite of the number of makerspaces, there are still big campus gaps. There is no campus space doing anything with virtual reality, for example. And finally, our group offered a couple of practical tips: if building makerspaces in this space, one needs to think through the adjacencies of which kind of space can coexist with others -- and which can't. And to be sensitive to issues of gender and inclusion, as some kinds of makerspaces are almost entirely male while others are mostly female. After the groups reported out, we were thanked for our contributions and dismissed. After the meeting, I have no ability to predict what affect, if any, our comments will have on the process.